Mallory Fenn became an artist in high school. She learned to be an archaeologist at New College. Combining the two into a career, though, was a complete accident. In her first year studying anthropology at New College, she was invited to participate in an independent study project in Chiapas, Mexico, where she visited museums, archaeological sites, and artist collectives to study the continuation of Maya weaving traditions. A borrowed camera broke on the first day of the ISP, and Fenn turned to her skill in drawing, the timeless – and reliable – way of documenting history. 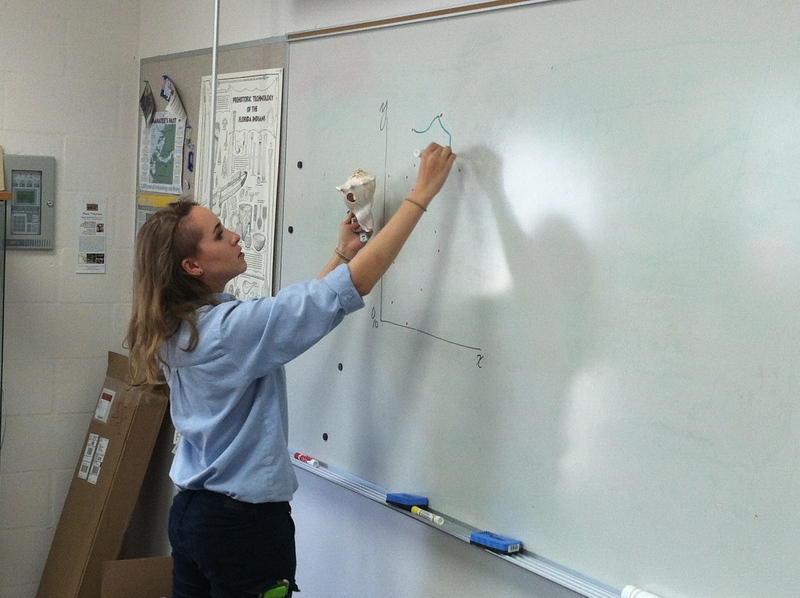 Mallory Fenn demonstrates how to properly draw and diagram an artifact using graphs. Fenn, who graduated in 2013, recently returned to New College for a workshop and talk at the Public Archaeology Lab. Now outreach coordinator for the Florida Public Archaeology Network, she discussed her path from dig teams at remote sites, to field schools and museums, thanks to navigating the crossroads of science and art. “I had no idea there was a way to combine my arcane interests together – everything I’m interested in all at once,” Fenn explained, as she sketched a model of an ancient tool onto a whiteboard. Fenn had developed her artistic talent at Miami’s Design and Architecture Senior High School, but discovered her passion for scientific illustration at New College. The faculty supported her work and she immediately began collaborating with professors Gabrielle Vail and Uzi Baram on independent research projects. These relationships were very important, as they helped Fenn gain valuable experience. “It was hard to get started as an archaeologist out of college,” Fenn said. Since she began freelancing as an archaeological illustrator at the age of 19, Fenn recorded Maya glyphs and iconography on pottery for an exhibit at the Lowe Art Museum, studied Pre-Hispanic Maya archaeology, calendrics and attended an archaeological field school in Cayo, Belize. After her experience in the field, Fenn was ready for a change. She worked as a conservation technician at Vizcaya Museum and Gardens, maintaining and preserving the artifacts on display to the general public and worked with the Wolfsonian Museum, where she assisted in researching, cataloging, cleaning and packing museum objects for a relocation project. Her current work with the organization brought Fenn back to New College, as she presented a crash course in scientific illustration to a crowd of enthusiastic students. She began her presentation with an explanation of the importance of artistic perspective, creative voice in sketching mock-ups of extinct animals, and how to create 3D space in scientific illustrations. After explaining the basics, Fenn held up a model of an ancient shell artifact and began to demonstrate how to properly draw and diagram it using graphs and different shading techniques. When she finished her demonstration, she brought out graph paper and pencils and oversaw each student’s process of sketching items using the proper methods. At the end of the workshop, participants were able to take home their work and were shown a whole new way of combining the arts with science.